FORT WORTH, Texas (March 30, 2016) – Texas Motor Speedway will become the state’s first professional sports industry entity and arguably the country’s first sporting venue to own its own beer with the unveiling of the No Limits Checkered Past craft beer during Wednesday’s annual media day at Gilley’s Dallas. The rapidly growing Audacity Brew House in nearby Denton created the No Limits Checkered Past session craft beer that will be sold at all major events at the world-renowned motorsports facility in Fort Worth as well as through retailers in the Dallas/Fort Worth Metroplex. No Limits Checkered Past officially will debut during the April 7-9 Duck Commander 500 weekend at Texas Motor Speedway. 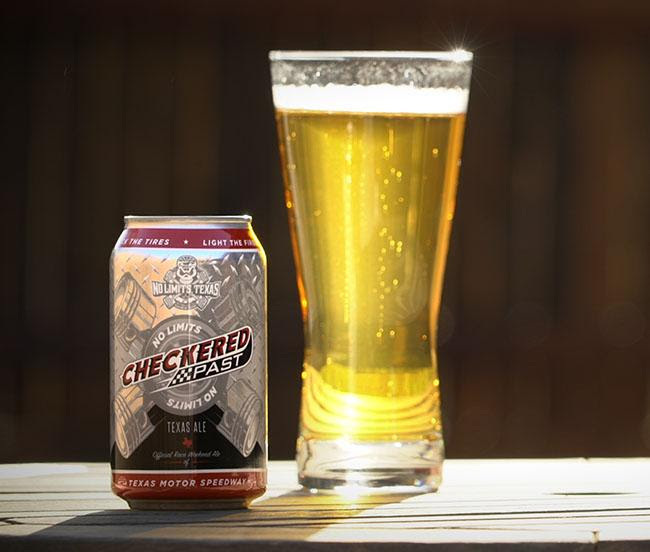 The appropriately named No Limits Checkered Past craft beer, centered around the speedway’s “No Limits, Texas” marketing campaign, is a versatile, light-bodied Texas steam beer that provides low bitterness and a character that revolves into a toasty, rustic finish that remains perfect for year-round consumption. Texas Motor Speedway President Eddie Gossage and Audacity Brew House co-owner Scott Lindsey unveiled the look and taste of No Limits Checkered Past by “opening” an oversized 55-gallon mock can of the newly created beer to celebrate the new product during the media day festivities. Guests of the event also had the opportunity to sample the craft beer as a sneak preview. The beer is carefully crafted with pale barley and lager yeast to provide a light, malt character that is aged for three weeks and cold filtered before being transferred into the signature No Limits Checkered Past can. The 12-ounce can features a diamond-plated look with the iconic No Limits, Texas skull logo adorned at the top with the No Limits Checkered Past logo across a race tire and pistons. Beginning with the upcoming Duck Commander 500, No Limits Checkered Past will be sold throughout Texas Motor Speedway. Following the race weekend, No Limits Checkered Past will be available at various local retailers. No Limits Checkered Past will become the 12th beer on Audacity Brew House’s lineup of popular craft beers. Audacity Brew House, which began operation nearly a year and a half ago, has exploded onto the popular craft beer scene after becoming Denton’s first brewery when it opened in 2014. The company, which brews its popular beers out of a 5,000-square foot warehouse with adjacent taproom, will expand their brand to also include an 8,000-square foot venue later this year called Audacity Brew House at Travelstead. The new facility, located near the historic downtown Denton Square, will include a restaurant and outdoor entertainment area. The increased space will allow brew master and co-owner Doug Smith to brew up to 10,000 barrels annually. For more information on Audacity Brew House, visit www.audacitybrewhouse.com. Click here to view/download the video interview with Texas Motor Speedway President Eddie Gossage and Audacity Brew House co-owner Scott Lindsey aboutNo Limits Checkered Past craft beer. Garlic’s… THE PLACE for Pizza and more! !